Believe it or not, this box contains the next four issues of McSweeney’s Quarterly Concern, which is quite impressive for such a teeny little box. 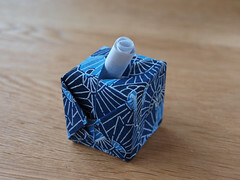 You can find the instructions for the box on their website. I used origami paper that I already had so I think mine came out a little smaller than if you print out and use their page. Every year, I like to hand make my Christmas cards. Depending on the complexity of the design that I come up with and the amount of spare time that I have, these either go out to everyone on the list or just immediate family. This year (like most others) it was starting to look like I wasn’t going to have the time to make any cards at all. 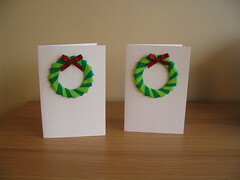 However, I managed to find a couple of free hours this weekend and our families will be getting handmade cards. The wreaths are made of 18-20 individual modular origami sections inserted into each other to form the circle, varnished slightly and then I glued ribbon bows to them and glued them to the cards. The wreath design came from a book, Origami Jewellery by Ayako Brodek, where it’s used to make brooches by gluing brooch pins to the wreaths instead. 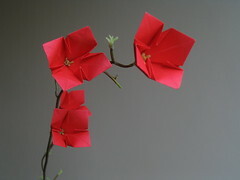 If you’re interested in checking out the book, be warned that it’s not for the origami purist! 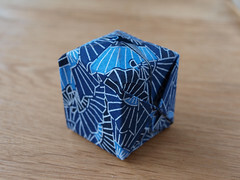 Lots of the designs involve at least a little cutting and gluing although there are some very traditional origami designs including the crane and the jumping frog. It also has a nice Christmas tree design that might end up on next year’s cards! Not content with the huge amount of knitting that has been going on, I’ve been having fun with other crafts as well. And thanks to the wonderful coincidence of a pet shop next to the craft shop, we found the perfect stones for the bottoms of the vases: aquarium gravel! 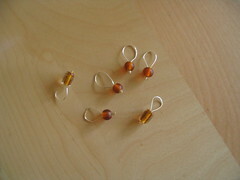 Also for the wedding, I’ve been working on some beaded jewellery. The necklace in the above picture is a vintage piece (circa 1920s) that I fell in love with when looking for something to wear with my wedding dress. The earrings are my own work (circa October 2008) since it became clear that it was going to be nigh on impossible to find vintage earrings to match the necklace. 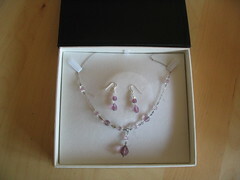 (Turns out that the lady who sold me the necklace wasn’t kidding when she said it was an unusual colour for that period.) Since I have absolutely no experience of beading or jewellery-making whatsoever, I’m really pleased with how well these have turned out. I’m going to change the earrings to make them smaller and more like mine and I may add more crystals to the necklace but I’m happy with how these are looking so far. I bought very fine chain for the necklace because I thought it would look better and without really thinking about how I was going to work with it. Fortunately, I also bought some smaller pliers at the same time so that I didn’t have to keep using the pair from my toolbox! Since I started using these (they show up really nicely against the black of my Sahara jumper) I keep getting asked about them at knit nights. No one seems to believe that they are as easy to make as I say so if I can find a spare 5 minutes during daylight hours, I’ll take some extra pictures and put up a how-to post. 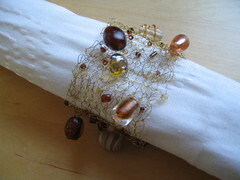 The beads are some left over from the Venezia napkin rings that I made last year (gratuitous picture follows). The 2008 craft marathon is off to a flying start thanks to a bout of food-poisoning that has kept me at home for a few days. 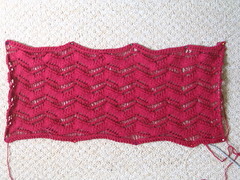 The Lace Ribbon Scarf is coming along nicely, if slowly. Here it is, roughly pinned out to show off the lace. The scarf is currently about 18 inches long (unstretched) and has taken an entire ball of yarn. I am hoping 3 balls of the yarn will be enough since I really want to make something for me with the other balls. I had thought that I would use the rest of the yarn to make a second scarf for me but I am not sure that I will want to knit another one straightaway, although, it looks so pretty that I am sure I will make more eventually! These three only took a single evening to fold so I should be able to get the rest done in plenty of time for Christmas. I still need to practise varnishing them and attaching them to cards though. 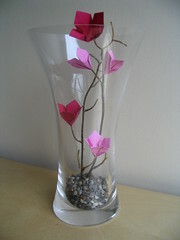 Finally, the wedding table centrepieces are coming along. We bought a couple more vases and the proper paper arrived. 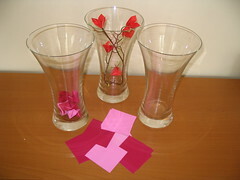 There are currently 9 flowers folded in the left-hand vase in the picture, so nearly two centrepieces’ worth. Which reminds me, I really should check with the venue just how many tables there are going to be! 2008 has been a busy year already and it does not look like it is going to get any less hectic with 2 professional exams and the wedding still to go. It also looks like being a busy year craft-wise. Current projects include the knitted lace scarf for my Gran, my Double Vision blanket and the origami flowers for the wedding table centrepieces. So far, so good. The wedding shawl: despite the problems that I’m currently having with a simple lace scarf, part of me still thinks this is a good idea! The kilt hose: do I really want to knit two gents’ knee-high socks? I love the thought of Steven wearing kilt hose that I’ve made him to the wedding, although I don’t know how he feels about it, but gents’ socks take a long time. Baby knitting: unfortunately, I Knit had a special offer on a beautiful baby pattern book when I went to the knitting group last night. I’ve ordered a copy so haven’t had a chance to take a proper look and decide on particular patterns but from the quick look I had, I’m considering making a hat, jacket, blanket and bootees for the baby and a nursing shawl for mum. All of which would need to be finished the same week as the wedding shawl and kilt hose. I think this could be considered “too much stuff”. 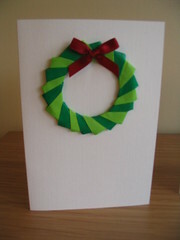 Christmas cards: I love making my own Christmas cards. Christmas has become so commercial that I really like being able to send people something that I’ve genuinely put some thought and effort into. Last year was the first year for several years that I haven’t made my own cards, due to lack of time, and I wasn’t happy sending out bought cards. 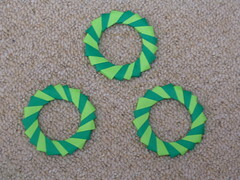 I bought an origami book recently that had a pretty modular origami wreath that my trial runs suggest would look great on the front of a card. I only have about 15 cards to make and the wreaths only require 20 separately folded modular sections each so that’s not that many, right? Immediately – the lace scarf for my Gran has to be finished before the middle of June so doesn’t really impact on anything else. Next 3 months – I’m studying and wedding-planning but should still have reasonable amounts of free time. I just need to juggle craft stuff with volunteering for DP. August to mid-September – Exam season. All other bets are off but some mindless knitting will probably be a good thing. Unfortunately, all the knitting I’d like to do involves concentration. Mid-September to mid-November – Run-up to the wedding. Any organising that hasn’t been done will need to be done now. Looking at my list of proposed projects, I’ll also be knitting till my fingers fall off! Mid-November to start of December – Honeymoon! I’m pretty sure not much of anything will get done at this point. December – Can I make my Christmas cards in the period between getting back from honeymoon and the last Christmas post? During which time, I’ll also be writing and sending wedding thank-you cards. Hmm, it seems unlikely. So, in conclusion, I need to spend the next 3 months doing all the the things on my craft to-do list to be sure of getting them done in time and hope that I don’t come up with any new ideas over the rest of the year. It’ll be interesting to see how many things I actually manage to get done. Watch this space! … coming soon to a wedding near you? 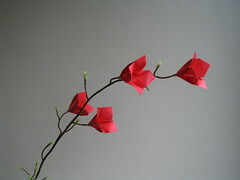 A little while ago, I spotted some beautiful origami table decorations for a wedding over on the Style Me Pretty blog. 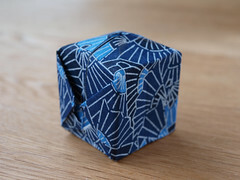 Being me, I saw the decorations and immediately thought, “I can do that”, despite not having done any origami for years! 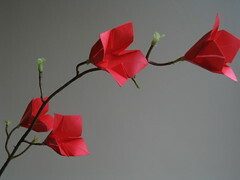 Since it’s a typical rainy bank holiday Monday, Steven and I spent this morning folding flowers. We’ve been experimenting with different styles and different ways of displaying them and think we may finally have hit upon our favourite combination. 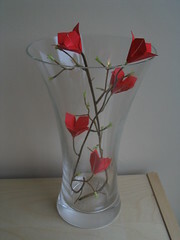 All we need now are some pretty vases and the patience to fold many dozen more identical flowers!